Shop New Old Signs this holiday season! The holidays are rapidly approaching and excitement of the Christmas season is beginning to fill the air. When contemplating gift ideas for that special someone, why not give them something unique? Why not get them something special? At New Old Signs, we custom make all of our products specific to our customers’ needs. Our signs are the perfect nostalgic gifts for anyone with a little wall space. New Old Signs are perfect for hanging in the living room, at the office, in the kitchen, or behind the basement bar. Was it a hotel or resort where you went on your honeymoon? Was it at the family business where you grew up helping out your Mom or Dad? Was it at a special restaurant where the two of you would always go for some grub? Does he or she have a favorite sports team or player that they have rooted for since childhood? At New Old Signs, we bring these memories to life in the form of a commemorative sign with a vintage look. Give us a call at 859.255.7446, or email john@thoroughgraphics.com to get the ball rolling on your unique gift idea this holiday season! This Friday, May 15, marks the beginning of the LexArts Downtown Gallery Hop, and we are pleased to announce that our New Old Signs will be on display at the Artists’ Attic, beginning at 5 p.m. Located on the fourth floor of The Square (formally Victorian Square), Artists’ Attic will be displaying the work of John Cox until the end of June 2015. 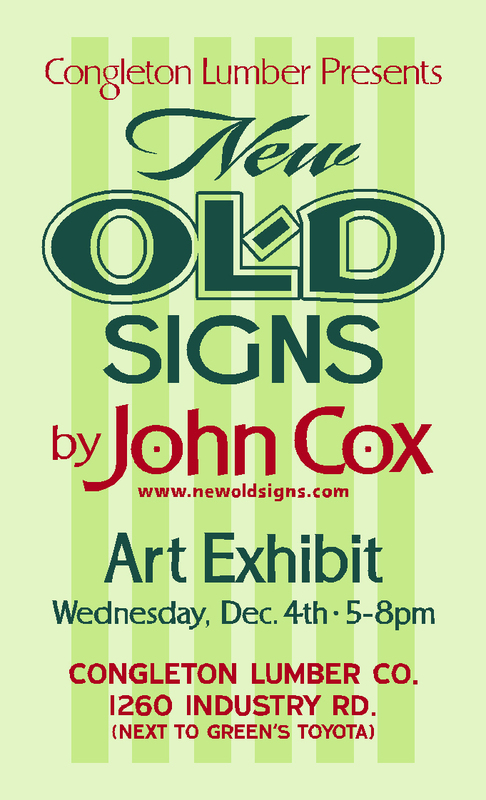 Friday’s opening of the exhibit lasts until 8 p.m.
12/17/14 New Old Signs Exhibit at The Tulip in Lexington, KY.
LEXINGTON, Ky. (Tuesday, Dec. 2, 2014) – For the third consecutive year, artist John A. Cox will host an annual New Old Signs Holiday Exhibit in Lexington, KY. On Wednesday, Dec. 17, Cox’s wide array of sign art will be displayed at The Tulip Restaurant and Bistro. Located at 355 Romany Rd. in Lexington, The Tulip has quickly become one of Lexington’s favorite restaurants since its opening in 2010. Complimentary wine, beer and hors d’oeuvres will be served to all guests from 6-9 p.m. For more information, email Cox at john@thoroughgraphics.com or call the Thorough-Graphics office at 859.255.7446. To reserve a table at the Tulip for after the exhibit, call 859.367.6687. LEXINGTON, Ky. (Thursday, July 17, 2014) – For the second consecutive year, John A. Cox has reached an agreement with Lexington-based Cross Gate Gallery, to exhibit an exclusive collection of New Old Signs at the Fine Sporting Art and Sculpture Exhibition at the Humphrey S. Finney Sales Pavilion in Saratoga Springs, Ny. Cross Gate Gallery has conducted the exhibit in Saratoga Springs for over 20 years. 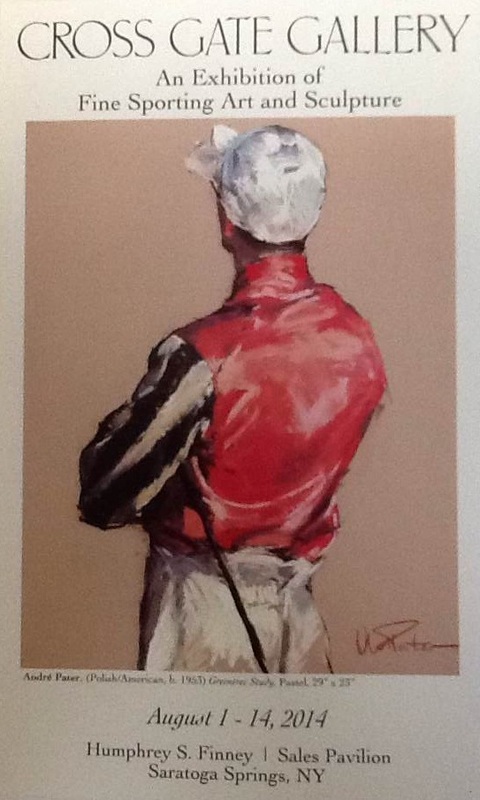 The historic Saratoga race meeting and the Fasig-Tipton Saratoga and New York Bred Sales attract some of the nation’s most renowned Thoroughbred horse owners along with some very serious art collectors. Last year was the first year that the New Old Signs were exhibited; 10 signs were selected by Cross Gate Gallery President Greg Ladd along with Cox and each one sold well before the exhibit’s end. This year, Cox is working on some new signs specifically for the occasion. Cox’s business,Thorough-Graphic Signs Inc., has made every plaque for the National Museum of Racing Hall of Fame, also located in Saratoga Springs. 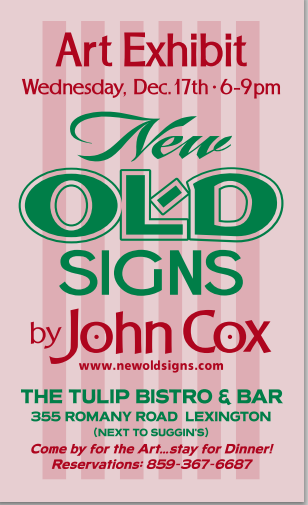 Cox mentioned that the two parties were close to an agreement for the New Old Signs on Thursday. Stop by and visit our booth at the Bluegrass Trust Antiques & Garden Show at Kentucky Horse Park’s Alltech Arena located at 4089 Iron Works Pike. For more information about the show visit the Bluegrass Trust Antiques & Garden Show website.